“As Hubble makes its 26th revolution around our home star, the sun, we celebrate the event with a spectacular image of a dynamic and exciting interaction of a young star with its environment. The view of the Bubble Nebula, crafted from WFC-3 images, reminds us that Hubble gives us a front row seat to the awe inspiring universe we live in,” said John Grunsfeld, Hubble astronaut and associate administrator of NASA’s Science Mission Directorate at NASA Headquarters, in Washington, D.C.
As the surface of the bubble's shell expands outward, it slams into dense regions of cold gas on one side of the bubble. This asymmetry makes the star appear dramatically off-center from the bubble, with its location in the 10 o’clock position in the Hubble view. 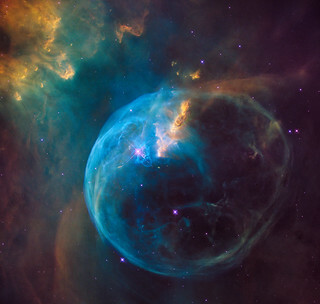 The Bubble Nebula was discovered in 1787 by William Herschel, a prominent British astronomer. It is being formed by a proto-typical Wolf-Rayet star, BD +60º2522, an extremely bright, massive, and short-lived star that has lost most of its outer hydrogen and is now fusing helium into heavier elements. The star is about four million years old, and in 10 million to 20 million years, it will likely detonate as a supernova. Hubble’s Wide Field Camera-3 imaged the nebula in visible light with unprecedented clarity in February 2016. The colors correspond to blue for oxygen, green for hydrogen, and red for nitrogen. This information will help astronomers understand the geometry and dynamics of this complex system. The Bubble Nebula is one of only a handful of astronomical objects that have been observed with several different instruments onboard Hubble. Hubble also imaged it with the Wide Field Planetary Camera (WFPC) in September 1992, and with Wide Field Planetary Camera-2 (WFPC2) in April 1999.